Northern Ireland beat hosts England on penalties to finish their Development Tournament with a 100% record. Unlike the previous encounter against the Republic of Ireland, it was Northern Ireland who scored a late equaliser before winning from the spot. Louise McDaniel was thwarted by the England defence in her effort to open the scoring and was forced off through injury. Shortly afterwards, the Young Lionesses were awarded a penalty which was converted to give them the lead. The second half started with England on top but with 10 minutes to go, both sides were creating chances as Northern Ireland looked for the equaliser. Two minutes into added time, Toni Leigh Finnegan’s free kick came through to Megan Bell, who drove the ball into the net and to send the game to penalties. 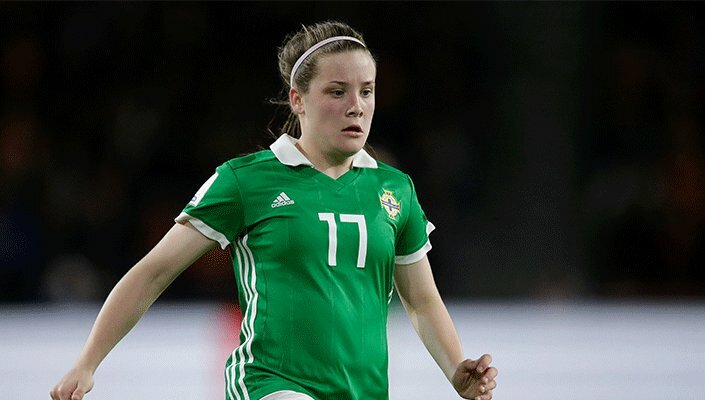 Irish goalkeeper Lauren Perry had been early replaced in the game by Beth Hopwood who saved England’s first penalty, with Northern Ireland scoring all four in a row through Bell, Caitlyn Hamilton, Emily Wilson and Lauren Robson. Hopwood then saved England’s next penalty for a 4-3 penalty victory, to give her side two wins in two at the tournament. The three-team competition at Queen Ethelburgas Collegiate in Yorkshire ends on 18th July, when England play Republic of Ireland.